As there is no indication about a degrading 12 volt battery like a struggling starter motor in an ICE, it’s condition that can bite you, and I am sure that is the reason for Renault advising replacement after 3 years. A bad 12 volt battery leads to the “Check Electrical System” dash message, talked about earlier here. It’s both a somewhat confusing message, and it seems to be not exclusively for a bad 12 volt system. Today I noticed there is a field the EVC called “Battery 14v to be changed display”, with possible values “-“, “Soon”, or “Now”. That seemed to be a fine candidate to add to the 12 volt screen. It’s already on the development branch on github and will make it in the next release. It’s the 4th line called “Replacement advice”. Feedback is appreciated! We’re interested to know if there is a CanZE “soon” message before the dreaded dash message, if the dash message corresponds to this CanZE message, and if so, whether the “12 volt battery symbol” (rectangle with two knobs on top) was also lit on the dash. Beside displaying this info in “12V battery” section, this warning (everything other than ‘-‘) could be displayed as a warning immediately upon starting CanZE? Could yes, but first we need to establish if it’s anything good to be honest. My battery is fine, so no way (yet) to know. Feedback appreciated. I had the message “Système ELEC à contrôler” 4 times since end of december (when my traction battery was upgraded to 41 kWh). I checked with canZE, also this morning while I had the warning, but the Replacement advice is still at “none”. Voltage of 12V battery reported by CanZE was 13.2V/13.3V while on, then with car off, went down to about 12.2V (which looks OK I guess). How the 12V current measurements can be interpreted ? Current is in amps yes. DCDC % is to be read as “DCDC converter load”. AFAIK the converter is capable of delivering 1kW (= 80 amps = 100%). Sorry for the late reply. Follow up: I have not yet seen anyone report anything but a – for the replacement advice. I have my doubts about it giving out helpful information. In the development version of CanZE, I have added two more fields I found which seem to indicate voltage and current under extreme load/charging conditions. If I am correct, it is the result of the pulsebox tests. I am talking > 100 A currents. These number require more interpretation but should give a more insight in the condition of the 12 volt battery. As I indicated before, I had the “Système ELEC à contrôler” warning, which later did not go away even after resting. 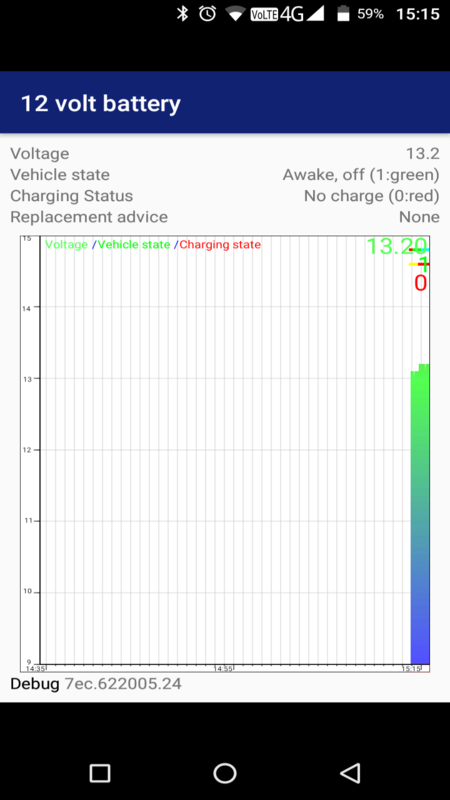 Renault then updated my EVC ( http://renault-zoe.forumpro.fr/t12422p25-problemes-apres-upgrade-22-41-kwh#266370 ) which version installed during 41 kWh battery upgrade was buggy. They also changed the water pump. But I still the “Système ELEC à contrôler” message still came back later, and it is now quite often (maybe because of winter), especially after a charge when I did not charge the day before.